Lumix DMC-GH4 Mirrorless Micro Four Thirds Digital Camera (Body Only) is rated 4.7 out of 5 by 313. Rated 4 out of 5 by Harold from I love this camera. I got this to use on trips and as a day-to-day camera. While the photos are not quite as nice as those from my Canon 6D and the video not as quite nice as that from my Blackmagic Production Cinema 4k, I would say this camera is much more portable, easier to use, and almost as good. I really like the two dials which makes it easy to use manual mode. The peaking works (surprised me). The ISO and other buttons are well placed allowing for quick changes to the setup. I don't think the low light sensitivity is as great as many say it is. It seems quite noisy when used at high ISO setting, but the noise cleans up easily with good software. Rated 5 out of 5 by John from Great Camera!!! This my third GH4. I primarily shoot classical music concerts and operas/musicals with locked off cameras, so having a camera that stops recording at 29 mins 59 seconds, is not an option for me. Lighting is not normally an issue, so f/4.0 at 640 ISO covers most of my theater shooting needs. For the money, there is not a better camera on the market. I have paired my cameras with the Panasonic 12-35mm f/2.8; Panasonic ?35-100mm f/2.8, and the Olympus 40-150mm f/2.8 - all great lense for my purpose. I plan on adding more GH4 cameras to my kit to save on rental charges for multi-camera shoots. FYI: I have been shooting video since 1981. Rated 5 out of 5 by michael from The real deal This is a great upward evolution of the GH camera series particularly for video work. Nearly all of the criticisms of the GH3 have been addressed in this iteration: manual focus peaking display, configurable zebra exposure guide and wireless remote control that actually works and is useful. All of those things plus in-camera 4K recording and a camera-out 10 bit workpath for those that need it. The only downside (and it is not insignificant) is that the lowlight performance is not stellar, certainly slower than you will be used to if you are coming from the Canon world. Still, nothing can touch the 'bang-for-buck' of the GH4. Rated 5 out of 5 by Joe from Amazing camera, amazing price! After shooting with Canon DSLRs for years, I decided to take my first step in the 4K transition with the Gh4. I couldn't be happier. Not only do I get 4K resolution in camera, I get all the camcorder functionality I kissed goodbye when started using DSLRs. Headphone jack, level meters, focus peaking, high frame rate at 1080p... the list goes on. I'm new to the micro four thirds world, but I'm really liking it. Panasonic lenses are small and sharp. And although I do lose a bit of functionality, I'm able to adapt my Canon EF lenses too. This is a great camera! And the fact that it's priced at 1700.00 makes it that much more appealing. Rated 5 out of 5 by Anonymous from The top 5 of 2014 Amazing product that goes beyond any other camera from this price point. Very compact for small productions, micro sensor size compatible with almost any brand and kind of lens in the market. Battery is life excellent For one man band or a small video production on a tight budget is perfect. Great sensor but it still needs light, beyond 1600 ISO you get too much noise , with a basic 2 or 3 light kit you will be able to get the job done in most of the situations. 4K its much better than HD ;so with the exception of slow motion I recommend to shoot everything in 4K, more detail, less moire, and of course future proof your work for the next years. Rated 5 out of 5 by Richard the Red from A Very Capable Camera This is my second GH4, needing two matching cameras for video interview shoots. Adding the V-Log software opens the realm of 12-stop capture, and the Atomos Ninja Assassin brought up 4K to 4:2:2 10bit. I bought the interface unit which also provides SDI, full-size HDMI and a better audio section with XLR inputs, too. I like the better zooms from Panasonic - those with constant maximum aperture, and found the 45mm Leica/Panasonic lens to be a fantastic closeup lens. I have had no mechanical problems with either of my GH4 cameras and only wish they were a little bit larger for my hands. The auto-focus could use a little speeding up. Rated 5 out of 5 by Buffalo Wing from Thrilled with my purchase Obviously, this is probably one of the most thoroughly reviewed products out there, so I'm not sure what I can add except that the addition of 4K to my video work has been a real game changer and I love the interface and how easy the transition is from the gh3 to this one. Although the body and form factor are almost the same, I've already found a preference for using this one even when shooting in 1080HD. The menu gives me so many more useful options, such as the pedestal, highlight/shadow controls, and the focus peaking is must have for me now. And for the price, I think it's the best deal out there. The image stabilization for the Panasonic GH4 is in lens only, and as long as the lens has image stabilization, this function will work while shooting 4K. Hi there,I intend to purchaseThe Panasonic Lumix DMC-GH4 camera from Your storeBut trying to find out before thatDoes the camera viewfinderCovering 100 percent ?Or do I need to buy an external viewfinder? 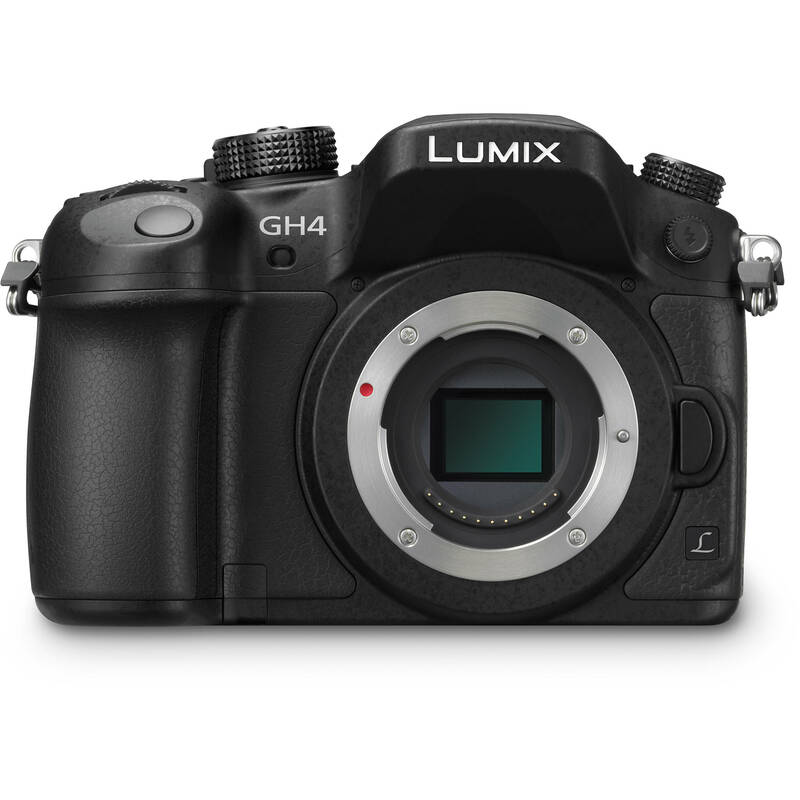 The camera viewfinder provides 100% coverage on the Panasonic GH4. Please email us at photo@&lt;a href= http://bhphoto.com target= _blank &gt;bhphoto.com&lt;/a&gt; for assistance. Do we need a SDXC card for 4K recording? or a SDHC U3 card is good enough? By adding the Panasonic battery grip, will this boost the shutter FPS greater than the standard 12fps without the added power? The battery grip will not boost the burst shooting rate on the Panasonic GH4. Does this body accept Sony e-mount lenses? I have several prime lenses for my Nex camera (copy sensor). Hoping to put these to use with a newer body. Unfortunately, the Panasonic Lumix GH4 will not accept Sony E mount lenses. Hi there. Is the audio buzz problem fixed on the newer GH4 cameras? Does the latest firmware update fix it? Thanx. Yes, the audio buzz issue has been addressed in a firmware update for the Panasonic GH4. Does this purchase include a one year USA Panasonic warranty or not? Because when I go to checkout, it only offers 2 and 3 year warranties and I'm trying to take advantage of the limited offer for extending my one year warranty to a two year warranty for free. But how do I know if I have a one year warranty if it doesn't say? The Panasonic GH4 has a one year limited Panasonic USA warranty. Unfortunately if there is no longer the option to add this extended warranty from Panasonic, the offer may not be available any longer.